I complied, of course, and am sitting here in my Tedy Bruschi jersey. Outwardly, I am in every way the loyal Patriots fan. Secretly, though, it is all an act. Yes, 17-0 is, in local parlance, wicked awesome. Yes, I’m very happy to be in the AFC Championship game for the fifth time in seven years. Yes, all those flashy offensive records are pretty cool. But inside, I am as an empty husk. Inside, I yearn only for one game, and it is not the Super Bowl. No. Under this football jersey, I wear the tee-shirt of my Red Sox of Boston. Invisible beneath the 54 is another number: 58. Hidden behind the block letters B-R-U-S-C-H-I, I wear the name of another man: P-A-P-E-L-B-O-N.
For the baseball fan, late January is always a time of quiet desperation. The hot stove season is largely over, yet even Truck Day seems hopelessly far away. 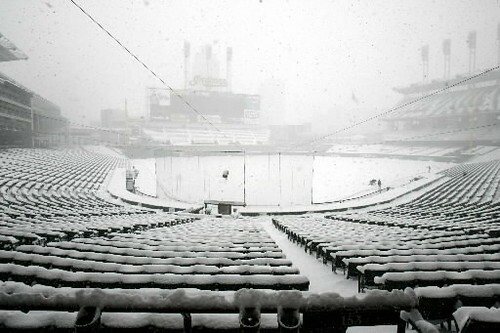 One begins to wonder, in the long, dark nights, whether pitchers and catchers will ever report. Just as people with seasonal affective disorder require an expensive sun-lamp to get them through the short, dreary days, baseball fans need some sort of sound machine to pipe the crack of the bat and the pop of the mitt into the silent, midwinter air. Baseball fans, I do not have such a machine. But I do have the baseball photos of the Library of Congress, conveniently archived on Flickr. Oh my lord, Sarah, me too. Me too. There is nothing like your first day game after the long winter, be it in a subtropical spring training setting or the first sunday home game. It’s such a unique, care-free feeling. Can’t wait. It happens every year. I get excited for the off season in October. The excitement peaks during the Winter GM meetings. Then the holidays take my attention away. Then January hits and you’re left with nothing. Can’t go outside to throw a ball And there are only two indoor batting cages in Manhattan – one’s too freaking expensive ($50 for 30 minutes) and the other one’s pitching machines spit out pitches with nasty top spins that make the ball drop off the table before it crosses the plate. Why are there only two??? I’m counting down the days until March 31st. Opening day at Wrigley Field, a day game of course and I don’t even care if there isn’t any sunshine. It’s better than all other holidays combined! Paul, your rhetorical question hangs in the air like a breaking ball that doesn’t break, just waiting for me to send it over the light towers with a crushing blow of anti-New York snarkiness. Bring it on, Mean Sarah Green. It’s not that Manhattanites don’t love baseball – it’s just that the property value here is ridiculous. You need a lot of space to build a batting cage. Problem is, $20 for five tokens isn’t going to cover the rent. True enough, Paul. That’s what the other four boroughs are for. Sarah…despite my enjoying the freedom of the off-season, your post made me long for the ever-present sounds and sights of baseball from April to October…I got a warm feeling inside just thinking about it. Yay for baseball! Pats to the Super Bowl. Excellent. This will leave only 2 weeks after that to Pitchers and Catchers. I know! If the Pats lose (GOD FORBID) it will be two weeks of emptiness and tears. If they win, it will be two weeks of party, party, party. Either way, I plan on reading all those books I always mean to read and writing several freelance articles on non-sports subjects. Yay for 14 days of productivity!